Rooted in Guadalajara, the Torta Ahogada is made with Birote salado, which has a thick crunchy crust and soft interior That is more salty than sweet. The consistency of the bread permits the sandwich to be submerged in sauce without crumbling or dissolving. The bread is sliced and filled with chopped pork, marinated red onions, tomatoes, refried beans, and covered with tomate and chile de arbol sauces. Happy Candlemas / Día de la Candelaria Day! The celebration of Candlemas originated in the late fifth century and it is celebrated with most enthusiasm in South America, Mexico and Spain. Candles are blessed, lit, and carried in colorful processions in celebration of Jesus being the light of the world. It is also the celebration of the purification of Mary, forty days after the birth of Jesus. In many countries, Candlemas is seen as the end of the Christmas season, when the decorations are taken down, the greenery burned with the remnants of the Yule log and the ashes spread over the gardens to ensure a good harvest. France: Candlemas is celebrated with crêpes, which must be eaten only after 8pm. If the cook can flip a crêpe one handed whilst holding a coin in the other hand, the family is assured of prosperity throughout the coming year. Ancient Britain: Celts celebrated with foods made with butter and milk – bannocks, for example were a type of flat griddle scone. Southern and Central Mexico, and Guatemala City: Día de La Candelaria is celebrated with tamales, a traditional Latin American dish made of starchy corn dough, steamed and wrapped in a leaf. Tamales are often filled with meats, cheese, vegetables, chillies etc. The Spanish throw a party, hosted by the person who found the baby Jesus in the Roscón cake at Epiphany. Grab a bite at Bolillo Tortas to celebrate Candlemastoday! Mexico’s had a long love for tortas— 48 yards, to be exact. 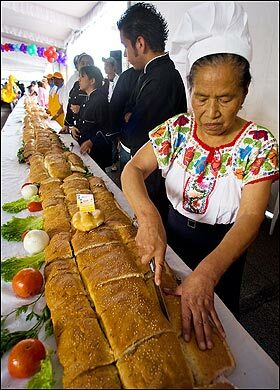 Mexico City caterers created Central America’s longest-ever sandwich, coming in at 48 yards. With the help of 45 torta outlets, the oversized baguette took only five minutes to make. The 1,320 pounds finished torta was filled with over 30 ingredients, including ham, cheese, avocado, and lettuce. The baguette — which will go down in history as one of the world’s largest food feats — was part of the kickoff for a three-day torta festival in Mexico’s capital. Read more here. This means full stomach, happy heart. Bolillo Tortas believes in providing the highest quality food for the best price. Its mission is to be the most important torteria in America and to be an ambassador of the true Mexican culture to a nation that is blinded by the negative aspects it sees in the news. We seek to combine the best flavors of a diverse country and deliver them in a singular experience that teaches your mouth about the flavors, your mind about the culture, and your eyes about the beauty of Mexico.